Co-op games are a sometimes complicated, exciting business where all of the members have to pull together to accomplish a goal. There are a number of games that require a fine synergy of skill, will, sweat, and tears for a party of co-op partners to achieve victory no matter how many players are involved. Iron Crypticle keeps all of that and nothing more, providing a barebones, easy-as-pie co-op experience that gives the basics of what (up to) four-player co-op can be. The game starts with players picking their favorite color of knight (Green being my personal preference) and hopping into the crypt where all players will fight rooms full of monsters and hope to survive as long as possible. You enter a room, monsters fill the room, you dodge the monsters attacks by moving the left joystick and administer your own attacks by pushing the right stick in a given direction. In very basic true twin-stick shooter fashion it is a loop of kill the monsters, move into the next room, repeat. The formula is tried and true, with monsters being creepy Crypt-dwellers and the room-to-room aesthetic being different enough that it rarely feels like retreading the same ground. If your party cannot survive the trip through the Crypt, death will offer some respite. When you die the game will unlock different items that you may stumble across in your next trip through the depths. These items range from weapons to different food and loot, but they never complicate the game as the types of weapons you’ll find offer a very straightforward change and the loot and food is used for points only. The weapons are also timer-based, so if you pick up a warhammer (a richoetting weapon) instead of your standard lance, you will use the weapon for a period of time and then be reverted to your lance soon after. Power-ups running on a clock works the best for everyone, since no one player will be able to get the ‘best’ weapon, and intense rooms will often spawn a weapon behind enemies, causing all of the players to scramble to grab the item before it disappears. As a player of any skill level can pick up a controller and point the stick towards the bad guys, the only true separation of ‘good’ and ‘great’ players in Iron Crypticle comes in one of two forms; coins and food. Food will provide points to a multiplier, so the more food a player picks up quickly, the more points. The caveat here is that once a given player gets 8 food items in quick enough succession without taking damage, the multiplier will max out. If the player then continues to grab food a random stat boost will appear in the room for any player to grab that will last until all players have died. These stat buffs will enhance movement speed, attack power, amount of health and so on. This can be quite useful, as friends of varying skill levels can pick these up strategically. Is one friend a bit bolder, landing a majority of your team’s punches? If an attack buff appears, maybe it will go to them. Does one friend struggle to avoid enemy attacks? Maybe they just need a bit more speed. This option provides a subtle yet sweet flavor to the gameplay, as it gives players something to aspire to acquire without making the game unbearable without it. The other variation to gameplay comes from coins. These can be used either to play a side-scrolling minigame or shop at the in-game stores where players can buy the previously mentioned stat buffs in case they have trouble making them spawn through the food method. 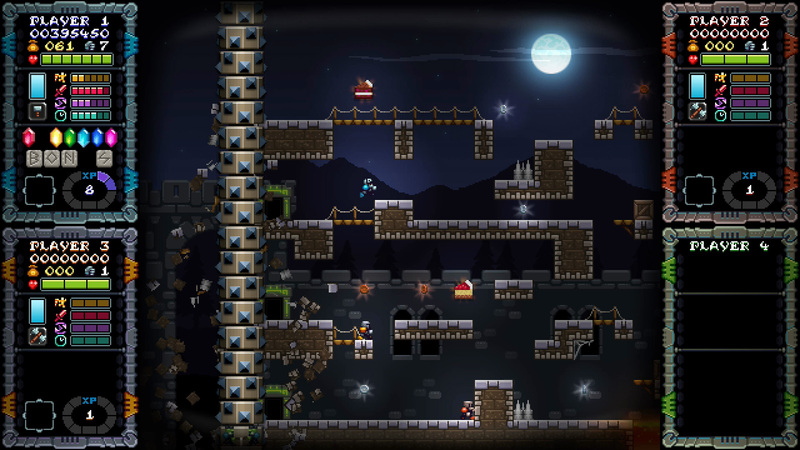 The discoverable little 2D side-scrolling minigames are placed in different rooms and are as simplistic as their twin-stick counterpart. Players pay money to play the minigame and try to move through the 2D world as fast as possible without dying while collecting more coins and bonus points as they go. These minigames are not easy, but if members of your party have experience with platforming this is a great way to bet some coins for more coins, as my party and I found ourselves keeping our pocketbooks healthy through these detours. Each floor to the dungeon is capped off with a boss fight and these all require parties to stay on their toes as they continue to dodge attacks and pummel the bigger baddie. These fights aren’t jarringly more difficult, but they will encompass entire rooms, often with different points on the foe being vulnerable at different times. Again, this is the type of challenge that a good team could fight through but a great team may choose to be more strategic by keeping different party members in different locations to attack when the opportunity presents itself. Iron Crypticle understands its own simplicity and because of that it leaves little ground for criticism past the lack of true depth. 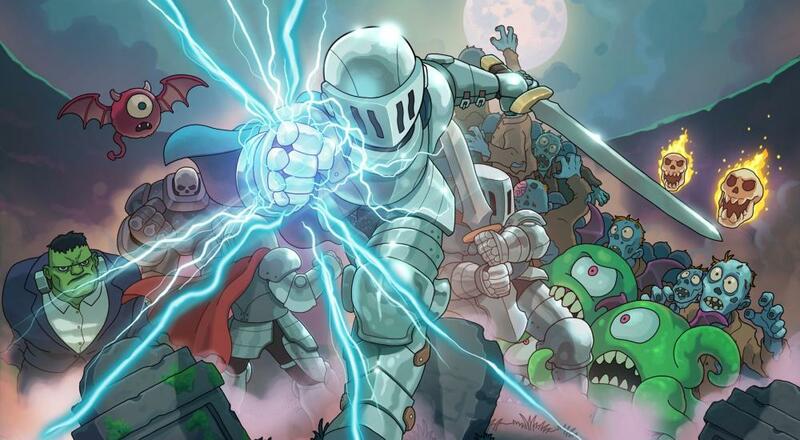 From the moment your knights leap into the halls of the undead there will be nonstop weapon throwing, foe dodging, boss battling, food and coin collecting fun. If you die, there is no true loss, since more items become available to try out and enjoy on a constant flow. 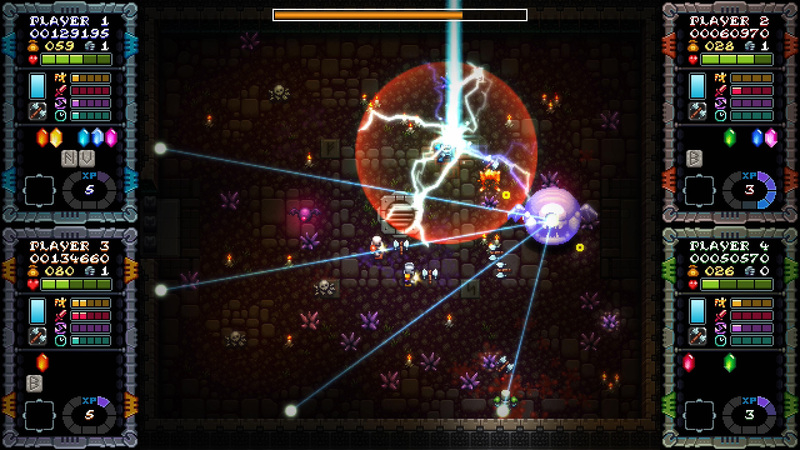 Iron Crypticle is simple, easy co-op fun that anyone can pick up and everyone will enjoy. Page created in 1.1544 seconds.